Draft fans! 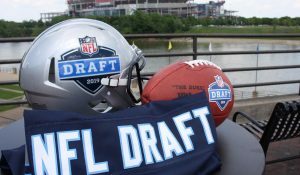 The 2019 NFL Draft is less than two weeks away! 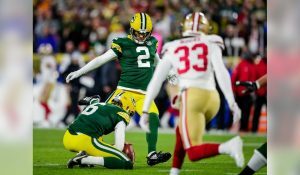 We are finally less than a fortnight from discerning what route General Manager Brian Gutekunst and his staff will take to improve the Green Bay Packers. With the front office having prioritized landing proven pass rushers in free agency, it is more than likely Green Bay will be looking at adding to the position later in the draft. Fortunately, this years’ draft has been blessed with depth and talented athletic freaks spinning, bending and ripping to terrorize quarterbacks off the edge. Eastern Michigan prospect Maxx Crosby blew away the combine, posting a 4.66 second 40 yard dash, to go along with his 10 foot broad jump at 255 pounds. Crosby is a name that is quickly rising in the draft community, as his athleticism and upside has scouts salivating at his potential as a pro. A small school gem who could become a starter for any franchise, Crosby’s athletic profile alone should see a team take a chance on him as early as the third round. The redshirt junior played in thirty-seven games at Eastern Michigan, recording twenty sacks, and a whopping forty-one tackles for loss. While “Mad Maxx” does not possess the first step quickness seen in elite edge prospects, his length and hand fighting technique project to his success in the NFL. Crosby would be a steal for the Packers in the fourth round and would provide much needed depth behind the Smiths’ and Kyler Fackrell. The University of Iowa seems to churn out NFL talent in droves throughout the draft, and savvy GMs know where to find it. This year is no different as 6’7, 271 pound pass rusher Anthony Nelson looks like yet another solid mid-round player. Every year draft fans and analysts love to find defensive lineman with the ability to simply push the pocket and disrupt the offense. That’s Anthony Nelson in a nutshell. While he is not a prototypical “bend the edge” player, the massive number 98 has a terrific set of tools that will serve him well in the NFL. He is a versatile player with the technique and power that would allow him to backup Preston Smith in the “elephant” role in Mike Pettine’s defense. Acquiring depth along the defensive line has to be a need for Brian Gutekunst, and yet again exploring the prospects’ of Iowa would serve the Packers well. TCU has recently produced many under the radar NFL talents. 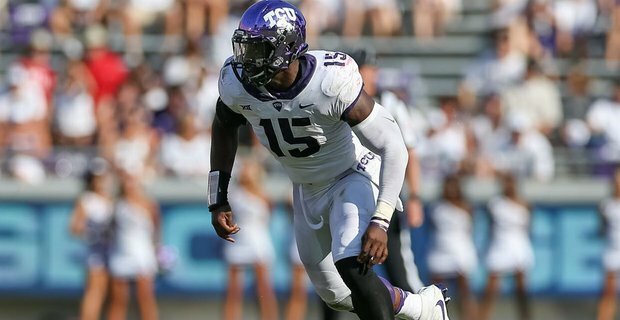 2019 is no different as the once forgotten school from Texas may see two pass rushers drafted in the middle rounds. While LJ Collier is rocketing up draft boards that have him taken as high as the second round in some mocks, it is Ben Banogu who makes the most sense for the Packers. Much like Crosby, Banogu’s athletic profile is elite. Standing 6’3 and 250 pounds, number 15 put up otherworldly numbers in Indianapolis, running a 4.62-40 yard dash to go along with a 40 inch vertical and a 7.02 three cone. While he does not possess the bend or flexibility of other top players, Banogu is extremely dynamic and explosive when attacking the football. The senior is a high effort player, who displays a large assortment of pass-rushing moves, with a fantastic spin. He remains raw with his technique, but with the right coaching his athleticism points towards him having a long and productive NFL career. Many NFL General Managers and talent evaluators describe any pick made after the third round as a “toss at the dart board”. Thus, it is extremely tough to project which players will be successful after the top one hundred picks. However, Green Bay has historically been one of the best teams in the league at unearthing top tier talent from the later rounds of the NFL draft. A key to keeping any team competitive and ultimately successful. The higher amount of top quality players the Packers can pluck from the draft, the better, and this years’ draft has as much talent as any. With six selections in the fourth or later rounds, the Packers brain-trust have ample opportunity to stack talent on the edge. This entry was posted in NFL Draft, Packers 2018-2019 Season and tagged 2019 nfl draft, Anthony Nelson, Ben Banogu, Eastern Michigan, Green Bay Packers, Iowa, Maxx Crosby, TCU. Bookmark the permalink.